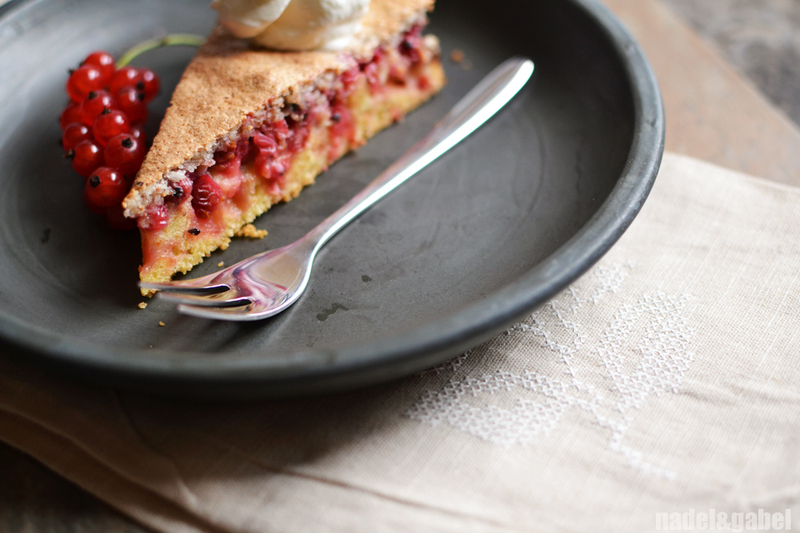 In dialect the famous swabian red currant cake is called ‘Träubleskucha’. This can be quite confusing for people not familiar to swabian dialect, because the name actually suggests that is a cake made of little grapes (‘Träuble’), which it obviously isn’t. But if you think of the appearance of a bunch of grapes and currants – well, there is some similarity after all. 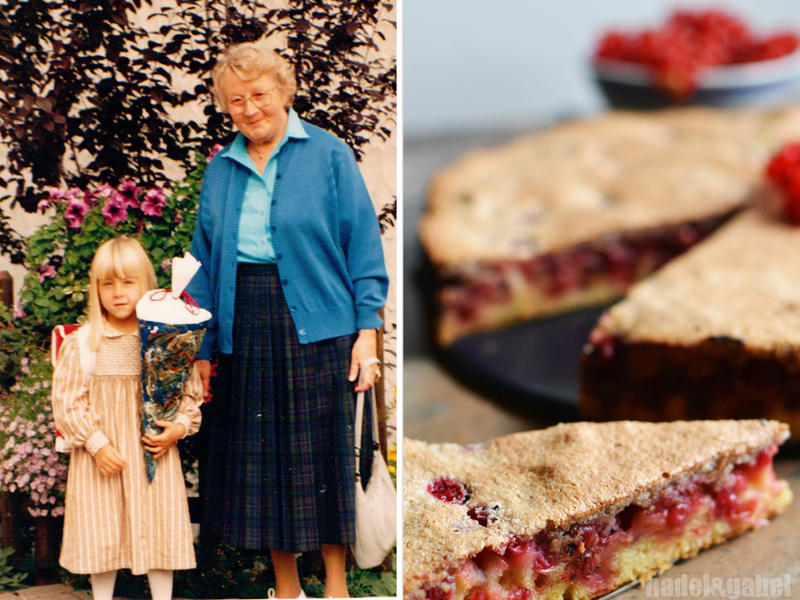 If it comes to the best recipe for this swabian red currant cake, for me the answer is as clear as possible – it is for sure the one my grandmother always made! No other recipe could possibly be able to hold a candle to hers. Why? – One answer would be: Because it is the one my grandma always made, one of only some recipes that are for me closely linked to her. It is also the traditional cake my mother always baked for us on birthdays when we were children. It is just home. 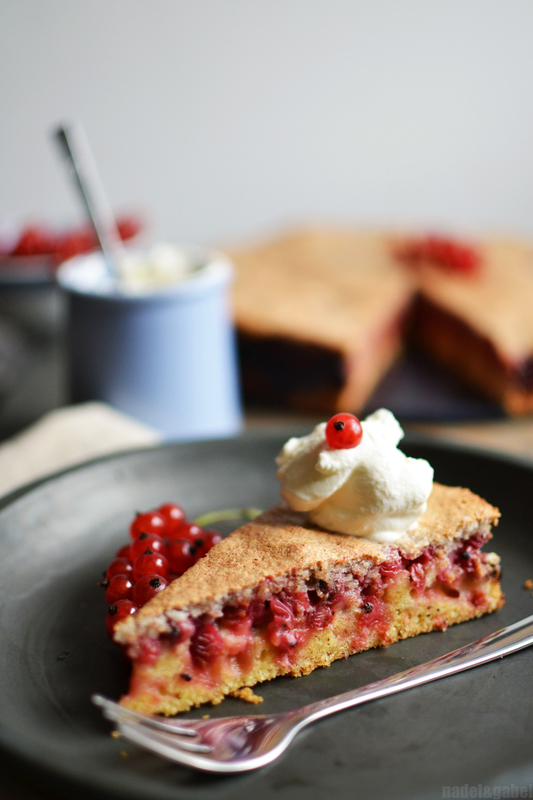 – The other – more professional – answer is: Because it is the perfect combination of a fluffy cake base, loads of juicy berries (500 g) and a crispy-sweet topping. In short: A perfect fresh summer cake. It is completed by the whipped cream you MUST eat with it! Seperate 2 of 4 eggs. 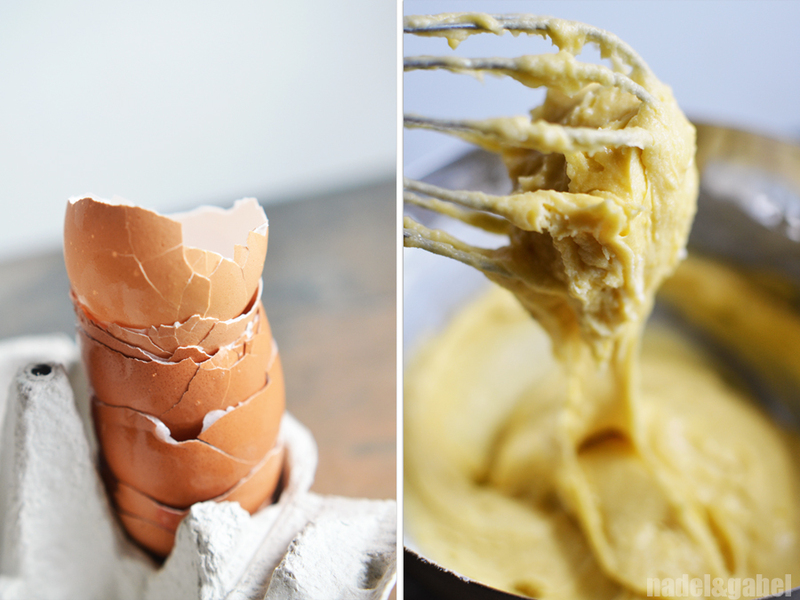 Make batter by first mixing sugar, butter and eggs (2 eggs, 2 egg yolks), then adding flour and baking powder. 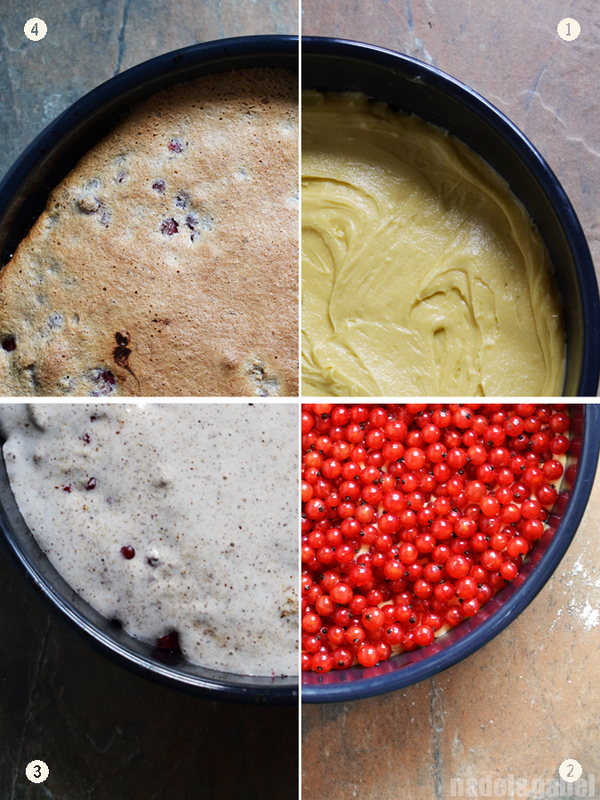 Lay out your cake pan with with baking paper and our batter in. Spread currants evenly on top of it. You won’t see a lot of the batter any more. Bake in preheated oven at 180°C for 30 min. When your baking time is almost over, start beating egg whites until stiff while adding sugar. Carefully fold in grounded nuts. Coat cake with egg-nut-mixture and bake for another 15 to 20 min. 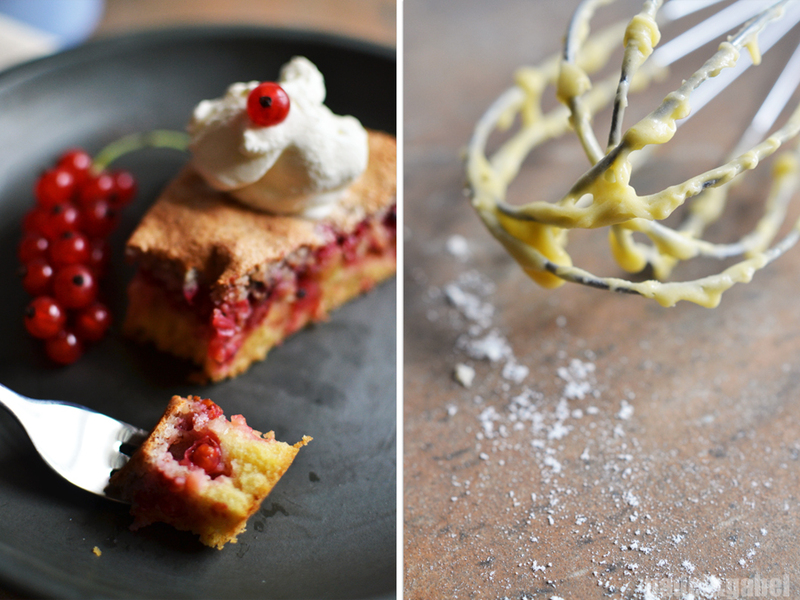 Cool down, optionally dust with icing sugar and serve with whipped cream. NOTE: As you may have noticed I’ve updated this post. I know, that is not the idea of blogging and usually I can accept that I’ve made some progress in photography during the last two years … but: this post was so popular during the last weeks and then it is my favourite cake, but the old pale and smoosh looking pictures didn’t really capture the feelings I have with it. So, when my parents brought me a bowl of fresh red currants from their garden, I couldn’t resist the temptation to bake and shoot it again. I also wanted to include my memories closely linked to this cake. They belong inseparably to the meaning of this cake for me. What a wonderful post and yummy-looking recipe! 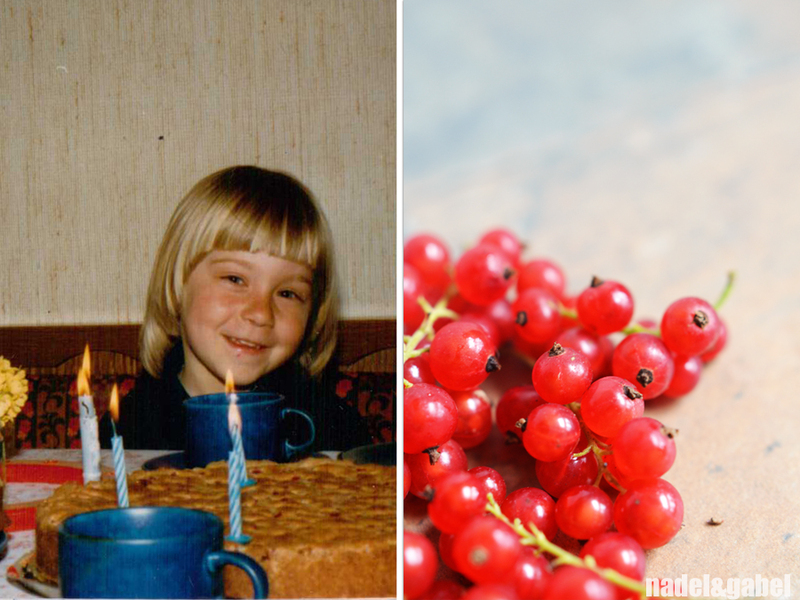 Growing up in Austria, I also had red currants in some baked goods. My mom didn’t make this cake, and I’d like to try it. I’m wondering about the almonds in the last step. May I skip those, or is there something (non-nut) that I could substitute? Thank you! This cake is exactly like the one my mom used to make! Delicious. Thanks so much!!! And by the way I have a very similar picture of me on my first day of school too. I just made this cake. It is amazing!! I will definetly make it again. Next time I think I’ll use only 2 eggs. I am not that used to eat eggs. The topping mixture is AWESOME! I’ll use it in all my cakes from now on, lol. Funny thing: all my berries ended up at the bottom of the cake (not in the middle as in the pictures), this did not affect the tease, though (I think). Hello -= I just wanted to say thank you so much for this recipe. My mother is German but I live in the UK where redcurrants are rarely available. Found some, made your cake and it was fantastic. I will be making it again! So cool! Thanks very much, Stefanie! Is it possible to use frozen redcurrants for this recipe? Yes, it absolutely works with frozen berries. I’ve made it with fresh and tried later with frozen redcurrants. The one with frozen redcurrants took longer to bake and is soggier compared to fresh. So I will use fresh in future. I’ve also made it with fresh blackcurrants and blueberries combination and it’s delicious! Thank you for the great recipe! I am a Canadian living in Germany and am always a bit nervous to bake a “German cake” for Germans. But this was a big hit at a party last night! Thanks also for your inspiring photos – those and your story made me really want to try the recipe.